A sweet frozen Charlotte china doll. 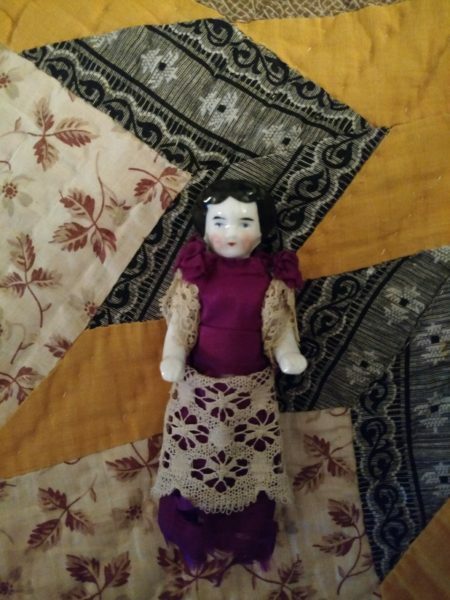 Dating from the late Victorian era, the doll stands with extended arms. Painted gold slipper shoes and ribbon painted around the knee to suggest her stockings. Although not marked, my guess she is probably German. Her purple and lace dress is home sewn, made to fit. A fashionable dress of the time period, the bodice is gathered at the neck line with poufs over the open lace draped sleeves. Skirt is pleated with wide panel at the front, and lace over skirt.